Holy Cross Church - Historical Catholic Church! We must face the sad fact that at 11 o’clock on Sunday morning, when we stand to sing…we stand in the most segregated hour in America. In his gospel, Matthew tries to show us that God’s vision for his people is an inclusive one, which grows from Israel’s calling as the people of God. It shows how the Gentiles are called to become a part of God’s chosen people. In other words, everyone—“Jew or Greek, slave or free, male and female”(Galatians 3.28), black or white, left or right, gay or straight—is now an equal member of the chosen people. In former generations this mystery was not made known to humankind, as it has now been revealed to his holy apostles and prophets by the Spirit: that is, the Gentiles have become fellow-heirs, members of the same body, and sharers in the promise in Christ Jesus through the gospel. Unlike Paul, but like all the other gospel writers, Matthew speaks of this “mystery of Christ” by telling a story. We call it the story of the Three Wise Men, but I’m not convinced there were three. Or that they were all that wise, when they fall as they do for Herod’s machinations. And it’s not at all important that they were men. Let’s call them what Matthew called them: the magi. We get our word ‘magic’ from ‘magi’. Magi were considered to be sorcerers, astrologers, interpreters of dreams, potion makers. They seem to belong more on the set of a Harry Pottermovie than in the pages of the Bible. But here they are. These magi had found a new star, a sign of the birth of a king, and they were off to see where it led them. They end up in the wrong place, and they are fooled by the puppet king Herod into cooperating with him—until God reveals in a dream that they need to avoid Herod. There are other figures in the Bible who are thought of as magi, and they have two things in common. They are Gentiles, and they are incompetent, foolish or unethical. I’m thinking of figures like Pharaoh’s court magicians who turned rods into snakes, or the interpreters of dreams in the Book of Daniel who had no idea, or of Simon Magus in the Book of Acts. I suspect Matthew thought of the magi who came to Jesus as such people—who by grace were shown the way to the true King. And who followed that way, and who were open to the dreams God sent them. Most of us here have one thing in common with the magi, and—let me assure you—it’s not that we are incompetent, foolish or unethical. It’s that we are Gentiles. I know I’ve said this before, but what we think of as normal was revolutionary for the people of ancient times. A community in which men and women, rich and poor, black, white or Asian can mix freely on equal terms was unknown. It came about because of the Christian Gospel, which proclaims that all are equal in God’s sight. Let’s look again at how important these magi are to Matthew. Right in the opening chapters of his Gospel, Matthew brings Gentiles into the centre. They worship Jesus, and name him “King of the Jews”. The nations came to Jesus in the person of the magi; Jesus sends his disciples out into the nations. The nations confess Jesus as King of the Jews at the beginning and the end of Matthew. At long last, the nations are drawn into God’s plan of salvation. and the glory of the Lord has risen upon you. He was speaking to people who had returned to Jerusalem after their return from exile in Babylon. He was encouraging them in a difficult time. and shall proclaim the praise of the Lord. Isaiah saw that one day Gentiles would come to the Lord. He saw Jerusalem as a great city, so great that it as they would bring gifts into it. 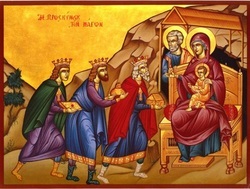 So Matthew tells us of the magi, bringing gifts, but not to Jerusalem. They went to Jerusalem first, but that was a mistake that cost lives. No, their gifts were for a young boy in a small town. Isn’t it marvellous how God turns things upside down? The magi are most likely followers of foolish nonsense who are led by God to the true King who is not in a palace, but in a nondescript town. But the important thing is this: they are included. God calls everyone to be part of the family. Church diversity is not something to ‘work on’, force or create. It is something that happens naturally when a church preaches the gospel. The gospel doesn’t hit key demographics, target race or keep particular races away. The church has far more important issues to fight for other than diversity. Let it happen naturally! It will happen naturally in my experience! When we preach the Gospel faithfully, the church is a diverse, inclusive family. When we “live out the mission of God as disciple of Jesus united in the Spirit”, we stop excluding people. When we forgive others as Christ as forgiven us, we look beyond artificial barriers of race, gender, politics or sexuality. When we look at others with the eyes of Christ, we see Christ in them. What shall we do in 2013? Let’s be the church family God calls us to be, inclusive, welcoming and forgiving, a family that tears down artificial barriers. Let’s bless others with the blessing we have received ourselves. Amen.